Home / Sports / Robben: "We learned from the Barcelona mistake"
Robben: "We learned from the Barcelona mistake"
An unhappy draw on Wednesday at the Allianz Arena was enough to seal Bayern Munich's qualification in the Champions League semi-finals for the sixth time in the last seven seasons. This, coming from the 2-1 lead over Sevilla, in the latter's field last week. Jupp Heynckes' entrants join Liverpool, Roma and Real Madrid in the semifinals. "Los Blancos" needed a penalty in the extra time, while Cristiano Ronaldo made void the phenomenal overthrow of Juventus in the Bernabeu. Meanwhile, Roma's 3-0 win at Stadio Olimpico on Tuesday, which saw Barcelona leaving the Champions League, was a warning for Jupp Henyckes Bavarians. "Of course it was a warning," Robben told reporters. - This shows that everything can happen in football. If you play at this level, you need a high performance. This will be the case even in the semifinals. We are already in the Champions League semifinals and in "DFB-Pokal". We have to go a little further. In the semifinals there are no favorites, we need to see who falls into the lottery and then prepare well. There are only good teams. " 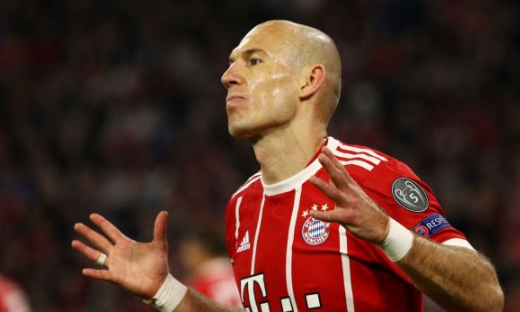 Robben admitted that it was not a good performance of Bayern on Wednesday but the Bundesliga champions rarely lost control of the action. "Outside, maybe 2-1 victory felt as if everything was closed, but we knew that Sevilla has a good team," he added. - In the first half we had some problems in the midfield, then the opponent has quality and could play with dignity. Sevilla, however, had little chance. We created more opportunities, but the one we missed was naked. We had to score a goal. "